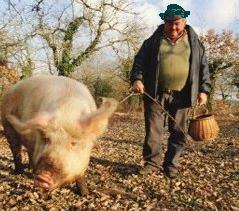 Farmer Brown and colleague randomly and selectively truffle hunting entirely for their own personal benefit. You’d expect a TV series showing detectorists incompetently “digging up dead bodies” (as one termed it) would be universally condemned. Yet many detectorists still haven’t done so and the overall hobby “verdict” seems to be settling down to a comforting “they were stitched up by National Geographic”. But the question is: “would bus drivers or bank clerks have been?” It seems unlikely. Anyway, one of them is also excused on the grounds he’s well respected and has “many Youtube videos showing how to detect properly”. However, that’s not what his website reveals. It recommends a letter to send to farmers which contains not a word about reporting finds or the code of conduct together with a contract to get him to sign which also says nothing about those subjects, Tellingly, he also advises people to talk to the farmer “about history not treasure” and not to show him the contract straight away “in case it scares him”. Friends, they are YOUR artefacts. The ONLY “contract” you need is to assert that fact and that access must be on YOUR terms. The authorities have no right to have damaged your interest by advising you to sign anything else. Friends, professionals clearly enjoyed a few days of fury over a telly programme but why aren’t they shouting permanently about the misbehaviour in your fields by huge numbers of people who fail to report finds and get you to sign contracts that benefit them, not you or history. You’re on your own about controlling that, the expendable victims of a failure to tell it how it is. Terrible, innit? If you doubt it, write and ask the Culture Secretary or PAS why they recommend you to sign a finds agreement and how it won’t damage your interest and that of the country. They won’t have an answer and won’t admit who insisted on it being said as the price of their reluctant signature on the official Code but I think I know. In fact even my pig Tanya knows that. “Cui Bono?” she seems to ask with her come-to-bed eyes every time she finds a truffle. Update, 20 April 2014 The cheery “digging up dead bodies” boast has now been hidden. (Or laundered, like much else, both in forums and fields.) The hobby can now carry on telling the public the participants were fine fellows, tricked into taking part by wicked National Geographic! « Monument preservation: that’s the way to do it!